Nicolas Kayser-Bril takes a look at HotNews.ro, a Romanian journalism site, formed by a group of financial journalists in 1999. This entry was posted in Editors' pick, Online Journalism and tagged hotnews.ro, journalism site, networked journalism site, Nicolas Kayser-Bril on January 6, 2009 by Judith Townend. Nicolas Kayser-Bril, contributor to the Online Journalism Blog and Observatoire des Media, has created an index of the interactive tools used by European news websites. 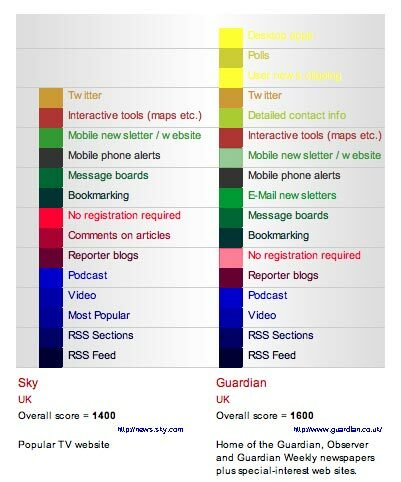 The index compares and contrasts which media organisations make use of tools such as Twitter, mobile alerts and social networks, as well as noting their policy on user registration for interactive services. News sites from the UK and France, to Macedonia and Hungary are featured – entries for additional organisations should be submitted to nicolas@observatoiredesmedias.com. The project is an extension of the work by Birmingham Post reporter and blogger Joanna Geary, who looked at the use of interactive tools by business news sites. This entry was posted in Online Journalism and tagged Birmingham Post, Birmingham Post reporter, European News Interactivity, france, Guardian.co.uk, Hungary, Joanna Geary, Macedonia, media organisations, Nicolas Kayser-Bril, Online Journalism blog, social networks, Twitter, United Kingdom on April 30, 2008 by Laura Oliver.